user warning: Table './active5_foxes/cache_filter' is marked as crashed and should be repaired query: SELECT data, created, headers, expire, serialized FROM cache_filter WHERE cid = '2:f5cc7de8a2cf4703f167613893b40fb1' in /home/active5/public_html/drupal6_multisite/includes/cache.inc on line 25.
user warning: Table './active5_foxes/cache_filter' is marked as crashed and should be repaired query: UPDATE cache_filter SET data = '<p>I feel like skipping tonight! And it&#39;s not just the spring weather in St. Louis. Nathaniel participated in a two hour augmented communication study at St. Louis Children&#39;s Hospital today and it was AMAZING!</p>\n<p>Let me back up and give some necessary info.</p>\n<p>We know Nathaniel will be non-verbal for a number of years at least. His <a href=\"http://www.catchingfoxes.com/content/day-fifteen-back-childrens-hospital\">trachea abnormality</a> prevents him from passing air over his vocal chords. As a side note, yes, that means Nathaniel does not make an audible cry. He cries like all babies, but the only sound is an increased respiratory rate. Everyone knows he needs a different way to communicate. The go to option of course is speech therapy.</p>\n<p>Anyone who doubted my post on my <a href=\"http://www.catchingfoxes.com/content/day-thirteen-sitting-hot-seat\">God-given nature of being assertive </a>needs to talk to Nathaniel&#39;s speech therapists.&nbsp; Go ahead. Talk to all three of them. Yes, my son has had three speech therapists in seven months. In my defense we lost one because she received a promotion and was no longer seeing clients. The other two? I had a hunch they were not offering what Nathaniel needed and I kept advocating.</p>\n<p>I taught my big kids baby sign language.&nbsp; Back before there were videos and apps and Baby Einstein tutorials. I was walking in a teacher&#39;s store one day and saw a book about <a href=\"http://www.amazon.com/Caring-Young-Children-Providers-Beginning/dp/093199358X/ref=sr_1_2?ie=UTF8&amp;qid=1394587097&amp;sr=8-2&amp;keywords=Sign+Language+for+Day+Care\">sign language for day care providers</a> for $3 and knew I needed it. Andrew, Peter and Ben were all under three years old. Nothing more needs said on why I needed a communication solution, right? By the way - I paid $3 for my copy, not $8. I&#39;m old.</p>\n<p>So naturally I assumed baby sign language would be communication option #1 for Nathaniel. What I didn&#39;t anticipate was with the growing popularity of teaching babies sign language, speech therapists developed strong opinions on what signs to teach, how to teach the signs, and when to introduce new signs. Little of what they said made sense to me considering my previous experience with my boys, but they were the professionals. I followed their lead. Sign language has moved very slowly.</p>\n<p>Meanwhile I moved on to option #2 for communication - pictures.</p>\n<p><img alt=\"\" src=\"http://www.catchingfoxes.com/sites/www.catchingfoxes.com/files/resize/blog/IMG_1460-486x365.jpg\" style=\"width: 486px; height: 365px; border-width: 5px; border-style: solid; margin: 10px;\" title=\"\" width=\"486\" height=\"365\" /></p>\n<p>Because Nathaniel has lots of different nurses and various family members providing care, I decided we had to label his toys one name only and everyone use that same label. 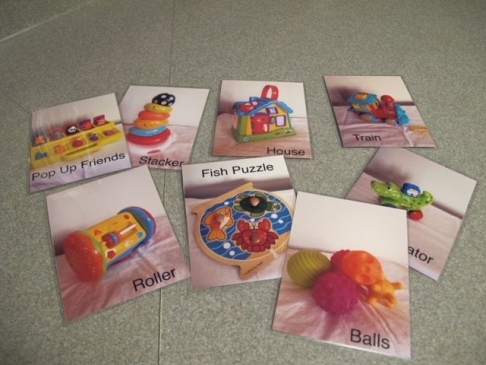 I started making labeled photo cards of his toys as an aid for us as caregivers.</p>\n<p>His speech therapist started using these cards to offer Nathaniel choices between two toys using a simple talker. Although oriented the wrong direction, the cards I made fit under the clear plastic covers. 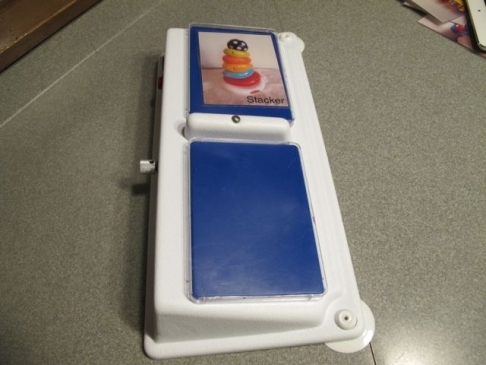 The device allowed us to record the name of the toy so that when the picture was pressed, he heard Mom&#39;s voice say, &quot;Stacker&quot; or &quot;House.&quot; It was anticipated that this set up would allow Nathaniel to indicate a toy of preference. We place the talker in front of him. He presses one button and then we give him the toy that he selected.</p>\n<p class=\"rtecenter\"><img alt=\"\" src=\"http://www.catchingfoxes.com/sites/www.catchingfoxes.com/files/resize/blog/IMG_1456-486x365.jpg\" style=\"width: 486px; height: 365px; border-width: 5px; border-style: solid; margin: 10px;\" title=\"\" width=\"486\" height=\"365\" /></p>\n<p>He wasn&#39;t ready for this type of decision making.</p>\n<p>Because a normal 15 month old plays with whatever is in front of him. Which was the talker. His typical response was to plant both palms firmly on both buttons and listen to Mommy&#39;s voice have a sound war. 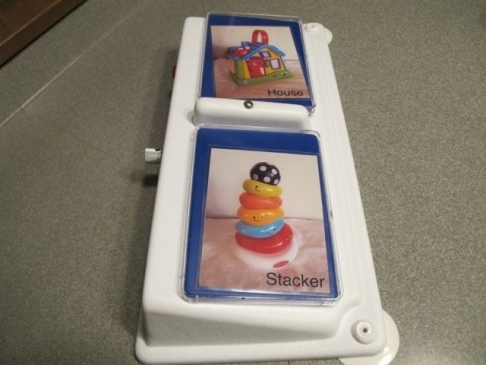 &quot;House.&quot; &quot;Stacker.&quot; &quot;House.&quot; &quot;House.&quot; Stacker.&quot;</p>\n<p>When we didn&#39;t get the desired result after a few weeks our speech therapist suggested we remove a card and offer him only one choice. &quot;Do you want your Stacker?&quot; Wait for him to push the button of the stacker photo while holding the stacker out of his reach. The empty button had no recorded voice output so logically that button wouldn&#39;t be chosen. Unless you are fifteen months old and just happen to like pushing buttons for the rewarding sound of plastic clicking against plastic.</p>\n<p class=\"rtecenter\"><img alt=\"\" src=\"http://www.catchingfoxes.com/sites/www.catchingfoxes.com/files/resize/blog/IMG_1461-486x365.jpg\" style=\"width: 486px; height: 365px; border-width: 5px; border-style: solid; margin: 10px;\" title=\"\" width=\"486\" height=\"365\" /></p>\n<p>At this point I felt a growing sense of frustration with the path we were traveling. Nathaniel has no diagnosis that limits cognitive development.&nbsp; He is delayed hitting milestones due to all that he has been through medically, but I have no reason to believe he won&#39;t learn in a normal trajectory. My course work for my Master&#39;s in English told me this wasn&#39;t normal speech development for a baby. Babies don&#39;t start talking with nouns and selecting between one toy and nothing, but rather they start talking using language that exhibits control and power. &quot;NO!&quot; &quot;Mine!&quot; &quot;Uh-OH!&quot; &quot;GO!&quot; &quot;More.&quot;</p>\n<p>The result of us limiting the field to one card? Nathaniel would huff and puff and get frustrated and sometimes hit the button with the photo of the stacker and sometimes hit the blank button on top and sometimes turn the talker upside down and play with the bottom instead. He learned pretty quickly that Mommy did something amazing with that red record button and that got more attention that anything. He was bored with the play we were providing as a learning environment.</p>\n<p class=\"rtecenter\"><img alt=\"\" src=\"http://www.catchingfoxes.com/sites/www.catchingfoxes.com/files/resize/blog/IMG_1459-486x365.jpg\" style=\"width: 486px; height: 365px; border-width: 5px; border-style: solid; margin: 10px;\" title=\"\" width=\"486\" height=\"365\" /></p>\n<p>Meanwhile, our family introduced option #3 for communication: an iPad. Nathaniel&#39;s older siblings pooled their money and bought him an iPad as an adoption gift. Because they are awesome. And they are smart. And they know this kid is going to talk through some sort of device some day. And they know technology is here to stay. I love my older kids. A friend offered a generous gift that provided a top notch case. I love my friend. Nathaniel mastered his <a href=\"https://itunes.apple.com/us/app/peekaboo-barn/id300590611?mt=8\">first baby app</a> in a couple sessions. With an isolated index finger point on both hands. When I mentioned this to the speech therapist it was ignored. Increased frustration for a mom who firmly believes technology is going to be part of our long term answer. Why not offer it now in some form?</p>\n<p>I walked into today&#39;s augmented communication study with lots of questions.</p>\n<p>And I pushed back when I needed more. &quot;Tell me why option A is going to be better for Nathaniel&#39;s semantic language development?&quot;</p>\n<p>And I walked out not only with an understanding on how to use sign, pictures, and the iPad all at once, but a baby who demonstrated using his voice in play.</p>\n<p>I know I will write more on today&#39;s appointment and Nathaniel&#39;s communication, and I know this is getting long, but you have to read a bit more... because this is the awesome part.</p>\n<p>Tomorrow we will start utilizing an app called <a href=\"https://itunes.apple.com/us/app/verbal-victor/id620426169?mt=8\">Verbal Victor</a> to get at the words Nathaniel, or any fifteen month old, wants to say. Those words of command and power. 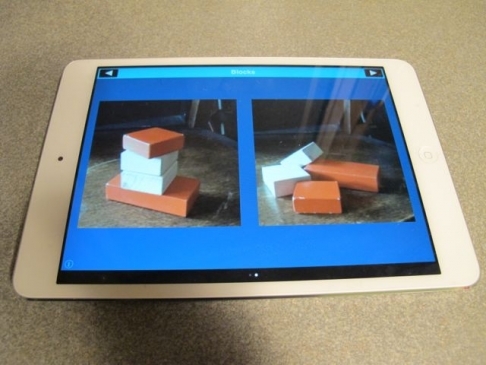 In less than five minutes I was able to set up two talking boards for Nathaniel.</p>\n<p>Talking board #1 - Blocks</p>\n<p class=\"rtecenter\"><img alt=\"\" src=\"http://www.catchingfoxes.com/sites/www.catchingfoxes.com/files/resize/blog/IMG_1458-486x365.jpg\" style=\"width: 486px; height: 365px; border-width: 5px; border-style: solid; margin: 10px;\" title=\"\" width=\"486\" height=\"365\" /></p>\n<p>Each picture offers a pre-recorded word when touched. Picture on the left has the word &quot;more&quot; recorded. When he touches this button, I will offer him more blocks and model building a tower. Picture on the right has the word &quot;Uh-oh!&quot; recorded. 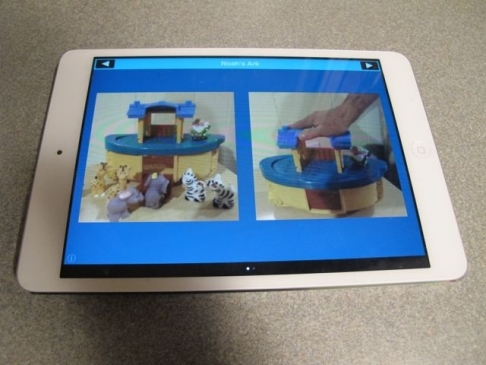 When he touches this button, we will knock the blocks over.</p>\n<p>This board is saved and available with a swipe of the screen so we can move quickly to blocks from some other toy and his words are ready. This is a huge improvement over manually removing pictures and recording new words with every toy. Our speech therapist had advised that I limit the number of toys we play with so that Nathaniel would learn the names on the cards assuming that limited field and labeling practice would help him select his toy of preference. Today I was advised to make talking boards on the iPad for every toy we play with and mix up his toys hourly. I can&#39;t tell you how thankful I was to hear that. Boredom had set in quickly for both of us playing with just a few toys while waiting for him to learn nouns.</p>\n<p>Talking board #2 - Noah&#39;s Ark</p>\n<p class=\"rtecenter\"><img alt=\"\" src=\"http://www.catchingfoxes.com/sites/www.catchingfoxes.com/files/resize/blog/IMG_1457-486x365.jpg\" style=\"width: 486px; height: 365px; border-width: 5px; border-style: solid; margin: 10px;\" title=\"\" width=\"486\" height=\"365\" /></p>\n<p>Picture on the left is &quot;more.&quot; I will keep the animals and offer them to him one at the time as he learns what &quot;more&quot; means and learns to use it. 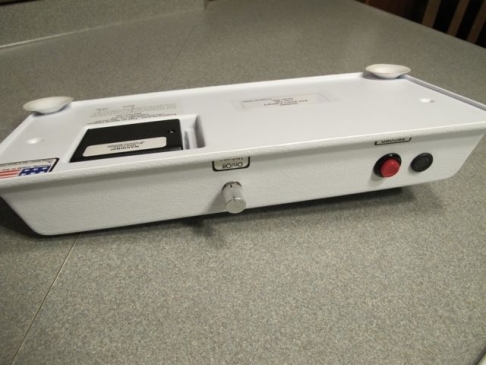 Picture on the right is &quot;go.&quot; We will make the boat zoom around the carpet when he selects this button. I will model a lot. I will use sign language for &quot;more&quot; and &quot;go&quot; alongside the app and the play so we are giving him lots of examples and methods of how to express his wants.</p>\n<p>I watched a speech therapist do the above type of play with Nathaniel today and within a couple minutes <strong>he </strong>was directing the play session. He was engaged and smiling. It was amazing.</p>\n<p>We have a LONG way to go in the next few years. And I know there will be frustrations ahead. But we have a starting place. A way to work on language <strong>tomorrow</strong> at his current skill level. Nathaniel is getting a voice.</p>\n', created = 1555819995, expire = 1555906395, headers = '', serialized = 0 WHERE cid = '2:f5cc7de8a2cf4703f167613893b40fb1' in /home/active5/public_html/drupal6_multisite/includes/cache.inc on line 108.
user warning: Table './active5_foxes/cache_filter' is marked as crashed and should be repaired query: UPDATE cache_filter SET data = '<p class=\"rtecenter\" style=\"\"><a href=\"http://www.facebook.com/CatchingFoxes\" target=\"_blank\"><img alt=\"\" src=\"/sites/www.catchingfoxes.com/files/resize/social/facebook-64x64.png\" style=\"text-align: center; width: 64px; height: 64px; \" width=\"64\" height=\"64\" /></a><a href=\"http://pinterest.com/kimmrankin/\" target=\"_blank\"><img alt=\"\" src=\"/sites/www.catchingfoxes.com/files/resize/social/big-p-button-64x64.png\" style=\"width: 64px; height: 64px; \" width=\"64\" height=\"64\" /></a><a href=\"mailto:kim@catchingfoxes.com\" target=\"_blank\"><img alt=\"\" src=\"/sites/www.catchingfoxes.com/files/resize/social/mail-64x64.png\" style=\"width: 64px; height: 64px; \" width=\"64\" height=\"64\" /></a><a href=\"http://www.catchingfoxes.com/rss.xml\" target=\"_blank\"><img alt=\"\" src=\"/sites/www.catchingfoxes.com/files/resize/social/rss-64x64.png\" style=\"width: 64px; height: 64px; \" width=\"64\" height=\"64\" /></a></p>\n', created = 1555819995, expire = 1555906395, headers = '', serialized = 0 WHERE cid = '2:48be9f28bc948ea32b70445d0a590c98' in /home/active5/public_html/drupal6_multisite/includes/cache.inc on line 108.
user warning: Table './active5_foxes/cache_filter' is marked as crashed and should be repaired query: UPDATE cache_filter SET data = '<div class=\"fb-like\" data-font=\"verdana\" data-href=\"http://www.facebook.com/CatchingFoxes\" data-send=\"false\" data-show-faces=\"true\" data-width=\"280\">\n	&nbsp;</div>\n', created = 1555819995, expire = 1555906395, headers = '', serialized = 0 WHERE cid = '2:854065b9b61ff8596c8fa62e384317c7' in /home/active5/public_html/drupal6_multisite/includes/cache.inc on line 108.
user warning: Table './active5_foxes/cache_filter' is marked as crashed and should be repaired query: UPDATE cache_filter SET data = '<p><strong>Catch for us the foxes, the little foxes that ruin the vineyards, our vineyards that are in bloom. </strong><br /><em>Song of Solomon 2:15 NIV</em></p>\n<p>Metaphorically, the &quot;foxes&quot; are the damaging attitudes and actions that can creep in and threaten the love relationship of a couple and a home. &nbsp;Catching Foxes is committed to being a resource as you guard against the things that might injure and destroy the harvest you are striving to grow in your home.</p>\n', created = 1555819996, expire = 1555906396, headers = '', serialized = 0 WHERE cid = '2:132a8457abcc78748ef29251eaa8f1d7' in /home/active5/public_html/drupal6_multisite/includes/cache.inc on line 108.
user warning: Table './active5_foxes/cache_filter' is marked as crashed and should be repaired query: UPDATE cache_filter SET data = '<p><a href=\"mailto:kim@catchingfoxes.com\">kim@catchingfoxes.com</a></p>\n', created = 1555819996, expire = 1555906396, headers = '', serialized = 0 WHERE cid = '2:fe7b2055d10a2c25c439ca4710d86502' in /home/active5/public_html/drupal6_multisite/includes/cache.inc on line 108. Anyone who doubted my post on my God-given nature of being assertive needs to talk to Nathaniel's speech therapists. Go ahead. Talk to all three of them. Yes, my son has had three speech therapists in seven months. In my defense we lost one because she received a promotion and was no longer seeing clients. The other two? I had a hunch they were not offering what Nathaniel needed and I kept advocating. I taught my big kids baby sign language. Back before there were videos and apps and Baby Einstein tutorials. I was walking in a teacher's store one day and saw a book about sign language for day care providers for $3 and knew I needed it. Andrew, Peter and Ben were all under three years old. Nothing more needs said on why I needed a communication solution, right? By the way - I paid $3 for my copy, not $8. I'm old. So naturally I assumed baby sign language would be communication option #1 for Nathaniel. What I didn't anticipate was with the growing popularity of teaching babies sign language, speech therapists developed strong opinions on what signs to teach, how to teach the signs, and when to introduce new signs. Little of what they said made sense to me considering my previous experience with my boys, but they were the professionals. I followed their lead. Sign language has moved very slowly. Meanwhile I moved on to option #2 for communication - pictures. Because Nathaniel has lots of different nurses and various family members providing care, I decided we had to label his toys one name only and everyone use that same label. I started making labeled photo cards of his toys as an aid for us as caregivers. His speech therapist started using these cards to offer Nathaniel choices between two toys using a simple talker. Although oriented the wrong direction, the cards I made fit under the clear plastic covers. The device allowed us to record the name of the toy so that when the picture was pressed, he heard Mom's voice say, "Stacker" or "House." It was anticipated that this set up would allow Nathaniel to indicate a toy of preference. We place the talker in front of him. He presses one button and then we give him the toy that he selected. He wasn't ready for this type of decision making. Because a normal 15 month old plays with whatever is in front of him. Which was the talker. His typical response was to plant both palms firmly on both buttons and listen to Mommy's voice have a sound war. "House." "Stacker." "House." "House." Stacker." When we didn't get the desired result after a few weeks our speech therapist suggested we remove a card and offer him only one choice. "Do you want your Stacker?" Wait for him to push the button of the stacker photo while holding the stacker out of his reach. The empty button had no recorded voice output so logically that button wouldn't be chosen. Unless you are fifteen months old and just happen to like pushing buttons for the rewarding sound of plastic clicking against plastic. At this point I felt a growing sense of frustration with the path we were traveling. Nathaniel has no diagnosis that limits cognitive development. He is delayed hitting milestones due to all that he has been through medically, but I have no reason to believe he won't learn in a normal trajectory. My course work for my Master's in English told me this wasn't normal speech development for a baby. Babies don't start talking with nouns and selecting between one toy and nothing, but rather they start talking using language that exhibits control and power. "NO!" "Mine!" "Uh-OH!" "GO!" "More." The result of us limiting the field to one card? Nathaniel would huff and puff and get frustrated and sometimes hit the button with the photo of the stacker and sometimes hit the blank button on top and sometimes turn the talker upside down and play with the bottom instead. He learned pretty quickly that Mommy did something amazing with that red record button and that got more attention that anything. He was bored with the play we were providing as a learning environment. Meanwhile, our family introduced option #3 for communication: an iPad. Nathaniel's older siblings pooled their money and bought him an iPad as an adoption gift. Because they are awesome. And they are smart. And they know this kid is going to talk through some sort of device some day. And they know technology is here to stay. I love my older kids. A friend offered a generous gift that provided a top notch case. I love my friend. Nathaniel mastered his first baby app in a couple sessions. With an isolated index finger point on both hands. When I mentioned this to the speech therapist it was ignored. Increased frustration for a mom who firmly believes technology is going to be part of our long term answer. Why not offer it now in some form? I walked into today's augmented communication study with lots of questions. And I pushed back when I needed more. "Tell me why option A is going to be better for Nathaniel's semantic language development?" And I walked out not only with an understanding on how to use sign, pictures, and the iPad all at once, but a baby who demonstrated using his voice in play. I know I will write more on today's appointment and Nathaniel's communication, and I know this is getting long, but you have to read a bit more... because this is the awesome part. Tomorrow we will start utilizing an app called Verbal Victor to get at the words Nathaniel, or any fifteen month old, wants to say. Those words of command and power. In less than five minutes I was able to set up two talking boards for Nathaniel. Each picture offers a pre-recorded word when touched. Picture on the left has the word "more" recorded. When he touches this button, I will offer him more blocks and model building a tower. Picture on the right has the word "Uh-oh!" recorded. When he touches this button, we will knock the blocks over. This board is saved and available with a swipe of the screen so we can move quickly to blocks from some other toy and his words are ready. This is a huge improvement over manually removing pictures and recording new words with every toy. Our speech therapist had advised that I limit the number of toys we play with so that Nathaniel would learn the names on the cards assuming that limited field and labeling practice would help him select his toy of preference. Today I was advised to make talking boards on the iPad for every toy we play with and mix up his toys hourly. I can't tell you how thankful I was to hear that. Boredom had set in quickly for both of us playing with just a few toys while waiting for him to learn nouns. Picture on the left is "more." I will keep the animals and offer them to him one at the time as he learns what "more" means and learns to use it. Picture on the right is "go." We will make the boat zoom around the carpet when he selects this button. I will model a lot. I will use sign language for "more" and "go" alongside the app and the play so we are giving him lots of examples and methods of how to express his wants. I watched a speech therapist do the above type of play with Nathaniel today and within a couple minutes he was directing the play session. He was engaged and smiling. It was amazing. We have a LONG way to go in the next few years. And I know there will be frustrations ahead. But we have a starting place. A way to work on language tomorrow at his current skill level. Nathaniel is getting a voice.